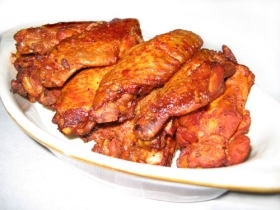 Have you made Broiled Chicken Wings? 1. 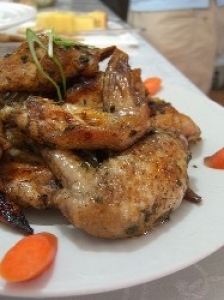 Remove tips from wings; cut wings into 2 pieces, and place in a shallow dish. 2. 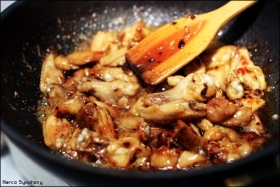 Combine lemon juice, soy sauce, and onion powder; pour over chicken. 3. 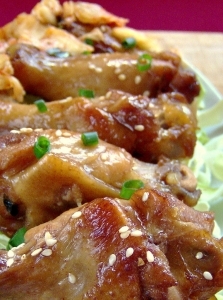 Cover and marinate wings in refrigerator several hours or overnight. 4. 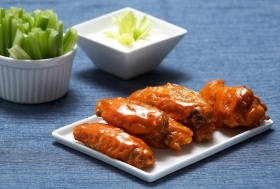 Drain chicken wings, reserving 1 tablespoon marinade; place wings on a foil-lined broiler pan. 5. Sprinkle with salt and pepper. 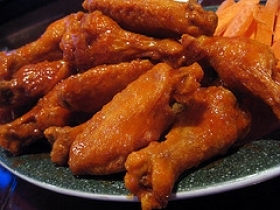 Combine reserved marinade, honey, and ketchup, stirring well; brush half of mixture on chicken wings. 6. Broil 6 to 7 inches from broiler for 7 minutes. 7. 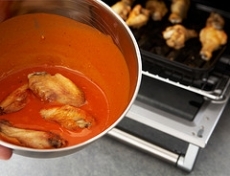 Turn and brush with remaining sauce; broil 7 additional minutes. This recipe contains potential food allergens and will effect people with Lemon, Soy, MSG, Poultry, Sulfites, Natural Sweeteners, Fructose Malabsorption, Onion allergies.